On Oct. 25, SpaceX test-fired the Falcon 9 rocket that will launch its Crew Dragon capsule on an uncrewed demonstration mission to the International Space Station in January 2019. SpaceX just took another step toward launching astronauts. On Oct. 25, Elon Musk's company test-fired the Falcon 9 rocket that will loft the Crew Dragon capsule on its first flight to the International Space Station (ISS) under a commercial-crew contract with NASA. Crew Dragon ISS missions will leave Earth from the historic Apollo-era Launch Complex 39A at NASA's Kennedy Space Center in Florida. 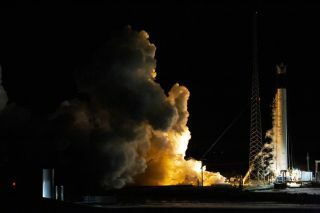 But last week's Falcon 9 static-fire test took place at SpaceX's rocket-development facility in McGregor, Texas, SpaceX representatives said. Both SpaceX and Boeing hold multibillion-dollar NASA contracts to fly agency astronauts to and from the ISS. Boeing will use a capsule called the CST-100 Starliner, which is scheduled to launch on its uncrewed demonstration mission to the ISS this coming March. Starliner's first crewed ISS flight is targeted for August 2019. Starliner will launch atop United Launch Alliance Atlas V rockets, at least for the foreseeable future. Crew Dragon is based heavily on SpaceX's Dragon cargo capsule, which has been flying robotic resupply missions to the ISS for years under a different NASA contract. Both Crew Dragon and Starliner can ferry up to seven astronauts at a time. When Crew Dragon and Starliner come online, they'll break a lengthy U.S. human-spaceflight drought. No crewed orbital missions have launched from American soil since NASA retired its space shuttle fleet in 2011. Since then, Russian Soyuz spacecraft have been astronauts' only ride to and from the ISS.